Current: YLC’s 40th Anniversary & Unsung Heroes Celebration! YLC’s 40th Anniversary & Unsung Heroes Celebration! 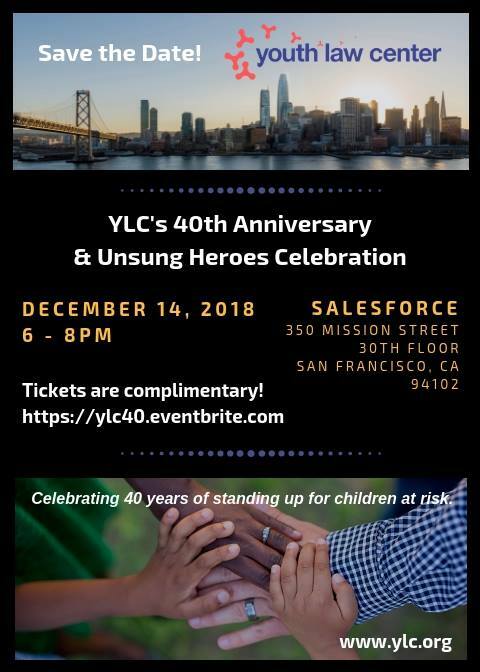 Please join the Youth Law Center at our 40th Anniversary & Unsung Heroes Celebration on Friday, December 14th at Salesforce in San Francisco to celebrate 40 years of YLC advocacy for children and youth in the foster care and juvenile justice systems! This special anniversary will be a celebration of all of our partners over the years on making the world better for system-involved children and youth, including our many Unsung Heroes. Over our 40 years, YLC has transformed the lives of tens of thousands of children across the nation by forging systemic and sustained change within the foster care and juvenile justice systems. Our goal is justice for children through ending harmful practices, ensuring effective parenting and nurturing healthy childhoods and successful adulthoods. In the spirit of celebrating our many Unsung Heroes, there is no cost to attend this celebration. This special event is made possible through the generous support of our individual donors and sponsors, to whom we are very grateful. Please join us at our 40th Anniversary & Unsung Heroes Celebration! We hope to see you all there. To sponsor, donate or RSVP online, visit us at https://ylc40.eventbrite.com today.